The Columbia Icefield, between Banff and Jasper, is the largest piece of ice south of Alaska, and one of the Canadian Rockies’ most impressive features. Snow Dome, as its name suggests, is one of the area’s least impressive peaks. Still, it is one of the hydrological apexes of North America, along with Triple Divide Peak in Montana, and offers impressive views of Mount Columbia, The Twins, Mount Bryce, and other high neighbors. When I did Kitchener last summer, I thought that would be my only time on the Icefield, since the normal access is via the heavily-crevassed Athabasca Glacier. So when Bob suggested ski touring up to Snow Dome, I jumped at the chance. When I woke up feeling a bit off on my first morning in the Tetons, I thought I had a minor cold, and skied the Spoon Couloir the next day. When I felt worse the next morning, I suspected something more serious, and began conserving my energy, taking a couple days off on my way up to Canada. Though I was useless and NyQuil-dependent the next day, I managed to cough my way up Snow Dome on a day with near-perfect conditions. Bob and Matt rolled into the Glacier Discovery Center from Calgary around 10:00, and we set our alarms for 4:00 AM and a short night’s sleep. We started walking up the snow coach road around 5:00, with no need for headlamps so far north. Though it loses some elevation dropping to the receding Athabasca Glacier, the road is still probably faster than skinning up from the toe of the glacier, especially when the road down to the glacier parking lot is closed. From the graded tourist area, we skinned across to the north side of the glacier, then began making our way around the three bands of crevasses leading to the icefield. We easily passed the first, then continued past the second on a good skin track, choosing to scurry beneath the seracs instead of navigating the crevasse around the glacier’s south side. The serac was more active than any I have seen, letting loose twice while we climbed, but there is enough on the glacier’s north side to avoid a direct hit by falling ice and snow. The ramp up the third crevasse band was an easy climb up a good switchbacked skin track, with only a few crevasse issues near the top, where the current track will probably soon have to be re-routed. With no features other than the occasional human, it is hard to judge distances on the Columbia Icefield. 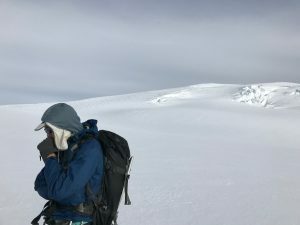 We climbed endlessly to a broad ridge northwest of the glacier’s head, with Mount Bryce’s intimidating north face finally coming into view to the southwest. The direct route to Snow Dome’s summit is a broken mess of crevasses, forcing skiers to circle around to its southwest side before climbing. 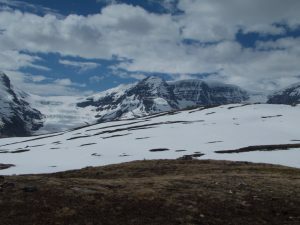 As we circled and climbed, Mount Columbia, the Rockies’ second-highest peak, came into view on the far west edge of the icefield. Once we finally had a straight shot at Snow Dome’s summit, it was just an endless slog to get there. The “peak” is not a perfect dome, but an endless series of false summits. Even when we finally reached the summit, we were not sure we were there until we passed it and saw neighboring Mount Kitchener’s south face. Despite magnificent views of Columbia and the Twins, we stayed only long enough to switch to downhill mode. The headwind that had started a few hundred feet below the summit had grown vicious, and none of us wanted to hang around. 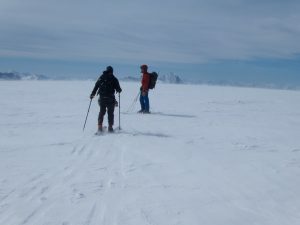 After being helped off the summit by a tailwind, I enjoyed carving fast turns down the hard-packed slopes, roughly following our up-track back toward the head of the Athabasca Glacier to stop for lunch in a more sheltered spot. 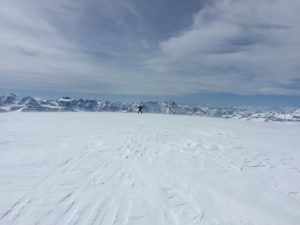 Other than a bit of cautious skiing at the head of the glacier, we had a wonderfully fast run down to its flat lower section, then an easy cruise to the toe. Taking off our skis, we clomped across the morainal debris, then stepped over the ropes back onto the tourist path, ending our day by climbing the road back to the parking area in the mid-day heat. The whole outing was about 6 hours up and 2 down, and far less intimidating than I had expected. Hopefully I can recover quickly enough to make another visit soon. This entry was posted in Canada, Skiing. Bookmark the permalink. Don’t I always? ;-) Once more through the Athabasca “death zone” this morning, and the probe definitely came in handy near the top, where things have melted out a lot in the last few days.